It was finally time to leave Mexico. I booked a “tour” for 300 pesos ($25USD) to deliver me easily through the border and into Guatemala. Departing San Cristobal at 6am, we picked up a motley crew of 12 travelers (including a GT look-alike and a group of American pre-med students studying and volunteering in Guatemala) and headed south. After about four hours we hit the Mexican border exit station. I’m still unclear about how we exited the country; we may have unintentionally bribed the bus driver. There’s a $25USD exit fee for most nationalities but the border agent waved the two non-student Americans in the group away from the official desk (where the Europeans paid) and then out on the street we were told to pay the fee to our driver directly. Hmmm… but we had our exit visa and did what we were told. 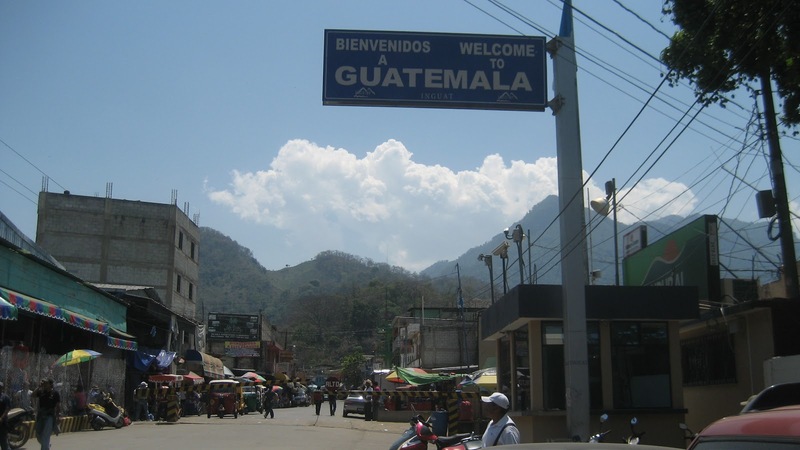 We easily passed through the Guatemala border, paid a $2USD entry fee, switched buses, untied and lifted the border gate, and went on our way. Guatemalan driving is crazy dangerous! The Guatemalan landscape was surprisingly different from Mexico. It is a country of volcanoes and the fertile sharp cliffs are covered in greenery. It was a beautiful view from the van. We arrived three hours later in Quetzaltenango or “Xela” (pronounced ‘Shay-la’), the second largest city in Guatemala. Initial day one impressions: Guatemala feels both similar and very different from Mexico. How to explain… for one, the architecture in central Xela is decadently neoclassic and gray instead of unadorned but brightly colored. Another visual difference are the textiles; women wear beautifully colored woven tops and skirts. The lottery is a apparently big deal; convenience stores that sell tickets have barred grates at the cash register and sometimes armed guards outside like the banks. Ice cream is super popular and cheap; I think I may have a new favorite snack. 🙂 The people have so far been lovely and helpful. And I don’t know how but Guatemalan children are abnormally super especially adorable. Xela’s neoclassic central park, volcanos in the distance. 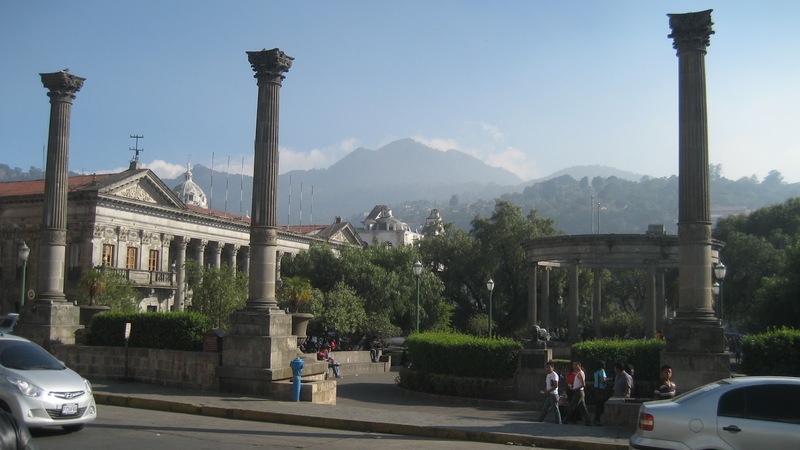 Xela is a magnet city for foreigners who want to study Spanish. Many “visitors” are actually longish term students. The night I arrived there was a social group of language students (including one animated Aussie enamored with the word “entonces” and gave a humorous and passionate defense of cricket) in my hostel bar having a drink. In the group were two Seattleites, one of whom grew up in the Tri Cities! We determined that her family most certainly must have crossed paths with mine back in the 70s… such a small world.